Coats of arms did not come into being until approximately the 12th century in Europe. The sudden increase in family coats of arms has been attributed to several significant events, such as: the First Crusade in 1097; the development of metal body armor; and the wide and general use of seals on personal documents. It is the general belief that the development and use of heraldic devices was closely associated with the need for better identification both in private life and upon the battlefield. During the Middle Ages, wars were a constant occurrence and in order to better protect themselves against the increasingly deadly weapons, soldiers (knights) were forced to added more and more armor. Eventually, they were fully covered from head to toe, which made it extremely difficult for one knight to identify another on the battlefield. Therefore, to reduce the confusion, a clear means of identification was essential. The solution was to paint colorful patterns on the knights battle shields. These colorful patterns became very popular and began to be used on other items that belonged to the knights. For example, the patterns were woven into cloth coats that were worn over the knight's suit of armor and horse. In the early days, simple patterns were employed but as the use of surnames increased, during the later half of the 12th century, these simple pattern gave way to more complex representation of animals and natural objects. Because of the popularity of these colorful identifications they were displayed with great pride by the knights and their families. However, this popularity made it necessary to register or copyright the designs to prevent two knights from using the same design. When a design was officially recorded the person who registered it was given exclusive rights for the use of the symbol. The word "heraldry" became associated with Coats of Arms as the result of medieval sporting events. During these events a "herald" would present each knig ht to the spectators. In general the "herald" would sound a trumpet and then read the knight's achievements and described his Coat of Arms. It was also the duty of the herald to record the knight's Coat of Arms as a way of ensuring that a family maintained its protective rights to have and use its registered Coat of Arms. Under heraldic rules, only the first son was permitted to bear their ancestor's Coat of Arms. Younger sons could only use a version of their father's Coat of Arms. If a Coat of Arms bearer died without male heir, his daughter was allowed to combine her father's Coat of Arms with her husband's Coat of Arms. As more powerful weapons began to emerge during the 14th and 15th centuries, armor was found to be less useful in battle and its use began to decline. However, by this time Coats of Arms were prized for their decorative effect and fathers proudly handed down the family crest to their sons. But the very popularity of these Coats of Arms began to fuel a movement which would threaten the integrity of the Coats of Arms. People wanting to have their own Coat of Arms began to coin their own and adorn them with embellishments and devices of little historical significance. To control this, the King created a central authority to inquire into the validity of the new creations. In addition, the King forbade anyone to take on a Coat of Arms unless by right of ancestry or as a gift of the Crown. To aid the authorities in their quest to eliminate false Coats of Arms, King Henry VIII of England sent heralds into the homes for "visitations" in an effort to discover whether or not a fake Coat of Arms was being utiliz ed. These visits took place at least once ever generation for about 200 years. However, none of these efforts proved to be effectual in maintaining the simplicity and purity of the earlier designs. They did, however, establish a set of records that have been extremely useful to researchers since the records show the usage of certain symbols and devices. This data is,in many cases, the only means for unraveling the complex familial relationships that existed in medieval Europe. In the United States, democratic traditions have considerably reduce interest in holding and preserving official Coats of Arms. In addition, the question of rightful ownership of Coat of Arms does not exist in the United States. The very nature of the settlement and development of this country makes it unlikely that any more than a few families have a legitimate claim to specific Coat of Arms. Instead Coats of Arms are highly regarded for their aesthetic and historical qualities. 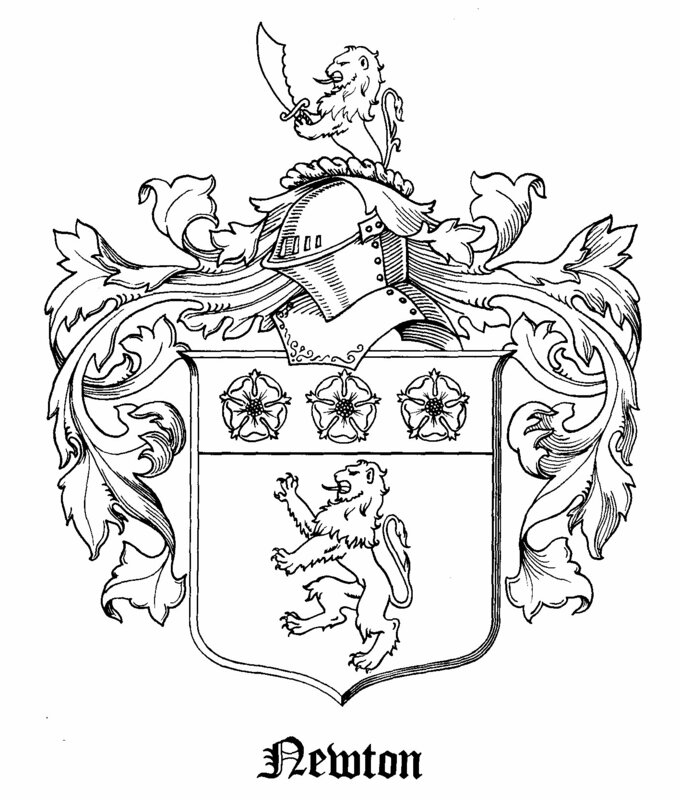 Burke's General Armory lists thirty-three different Coats of Arms for the Newton family. Note: Some of the information given in this article was derived from a book by Sir Bernard Burke: "The General Armory of England, Scotland, Ireland, and Wales," London: 1884. This book was reprinted by Genealogical Publishing Company in Baltimore, Maryland in 1969. This is considered the main reference source for English coat of arms. The shield shown below is one of hundreds that belong to the Newton name. It is not known if the Newtons that came to Butler County, Alabama was a member of any clan which owned the rights to any of these. However, this is of little importance since coats of arms are not significant in the modern world.